Somehow tomato pulaos always reminds me of my childhood days. Amma makes the best tomato pulao and I have learnt it from her. This tomato pulao is a must in the menu when my sis in laws visit us. They like it so very much and always look forward to it. I normally make the tomato pulao with cauliflower subji. This time it was a different combination and this also went very well. 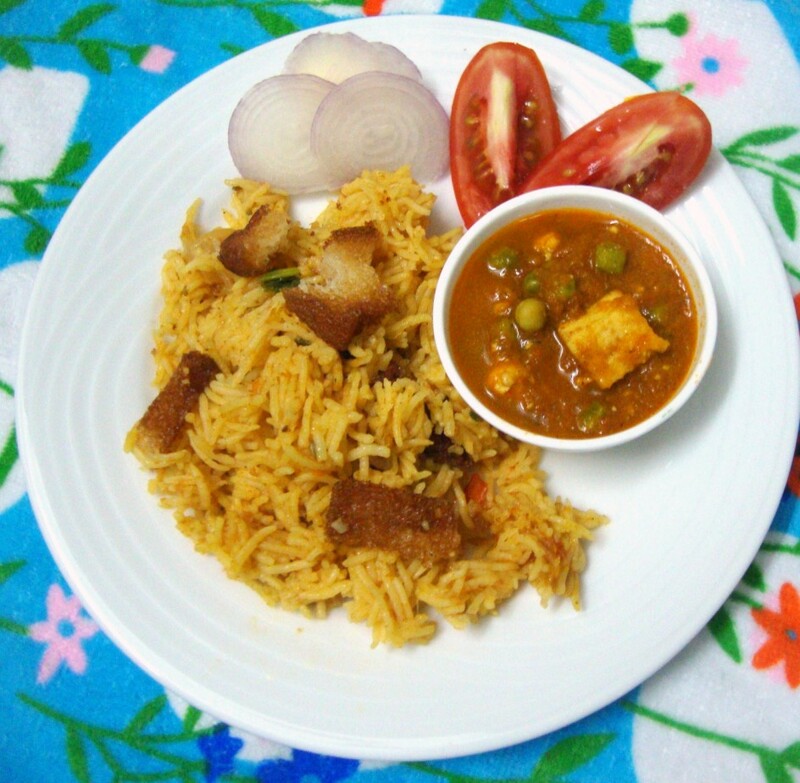 We make both Tomato Pulao and Mutter paneer in a different method. This is second method of making. I adapted the Mutter Paneer from Sanjeev Kapoor. This is a simple gravy dish that makes a great side dish for biryanis. 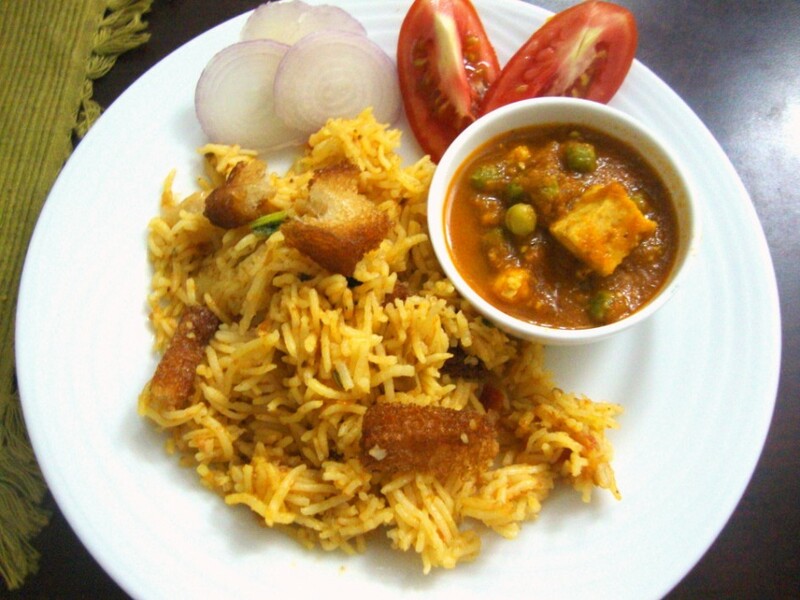 Looking at the tomato biryani, I was reminded of my childhood days when Amma used to add fried bread pieces on the top. Somehow that takes it to the next level. When you take a bite of those fried bread with the delicious biryani, it’s sublime! You must try this combination to enjoy on a weekend. With the rains that’s pouring insistently in our place, this makes a great meal! Trim and cut the bread into square pieces. Heat a pan with the ghee and roast the bread. Keep it aside. Wash and soak rice for 15 mins. Once done, drain the rice and keep it aside. In a pressure cooker, heat oil, add the whole spices, saute for couple of mins. Then add the onion julienne, saute till they turn translucent. Then add ginger garlic paste, chilli paste, saute till the pastes till it’s cooked. This takes about 2- 3 mins. Add the mint and coriander leaves. Then add the tomato puree, turmeric powder, chilli powder and salt, fry for 5 mins. Then add the rice and saute gently, once done, add water and pressure cook for 2 -3 whistles. Once the pressure falls down, add the butter and chopped coriander leaves and garnish with roasted bread pieces. Cut the paneer into cubes. Heat sufficient ghee in a kadai and deep-fry till light brown. Remove and keep it aside. Chop onions and ginger finely. Use the same kadai with ghee, add chopped onions and ginger. Sauté till lightly browned. Add turmeric powder, red chilli powder, coriander powder, salt and peas and cook, adding a little water, till the peas are tender and a little gravy remains. When the gravy is cooked, add the fried paneer, garam masala powder and simmer for five minutes. Garnish with coriander leaves, remove. Serve hot with tomato biryani. I took this picture that reminded me so much of my childhood times, when amma would always garnish the biryanis with fried bread pieces. Since the biryani is tomato base, the gravy went very well as it didn’t have tomato in it. I am sending this to Sreelu who is hosting “Vegetarian Thanks giving” for Healing foods, an event by Siri. Whether I celebrate Thanksgiving or not, I have always been thankful for the wonderful memories each meal reminds me, and the many folks who have shared their memories with me. Matar paneer looks super delicious and inviting. lovley combo. I love the fried bread pieces on the rice. Very homely and comforting.. right for this cold season.. 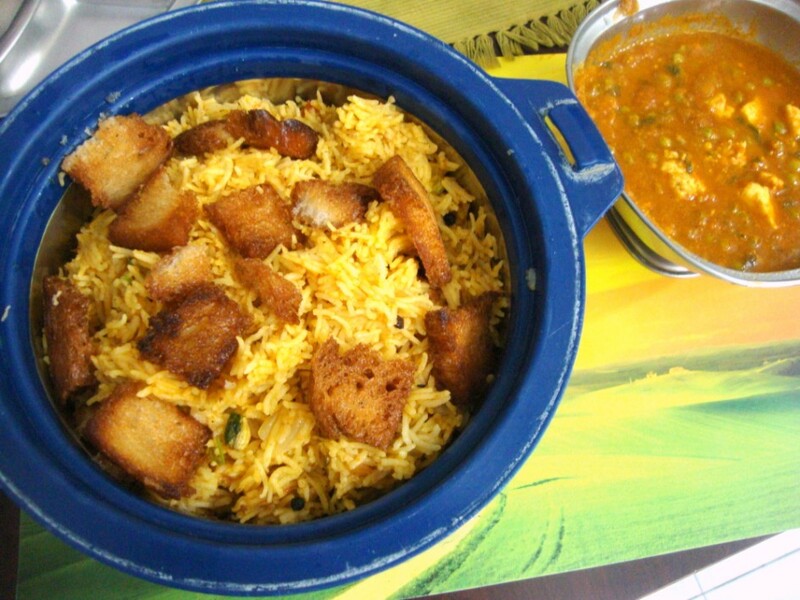 Delicious looking biryani and mattar paneer… love the combination..
Lovely combo looks delicious and tempting. The biriyani and the paneer matar look so tempting. A great lunch indeed!! healthy one.. just made a pulav for Sunday brunch last week with bread crumbs ! Such a yummy combo.. 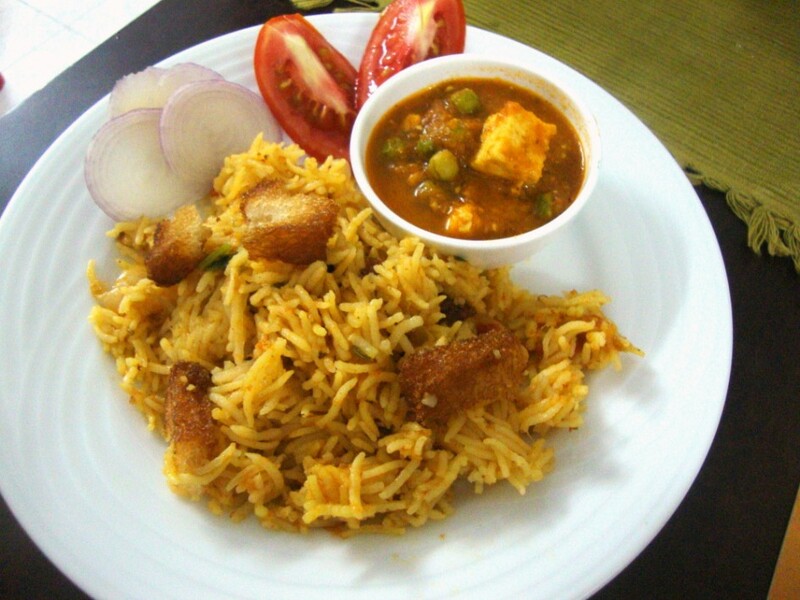 I've never tried tomato biryani, I usually make tomato rice–but this looks delicious.. Bookmarked.. Thanks for the recipe. Yummy rice and love the combo. Yum yum,just drooling over that fabulous curry…. Like you I suddenly remembered that my mom used to make a pulao just with bread slices. That reminds me that I should call mom and ask her about it. Love this! Especially the bread pieces. Just wanted to confirm that you don't add any tomatoes to the Matar Panner? Oh ok. Thanks. The picture of the matter Paneer looked like it had tomatoes.